Captionfish is our community partner in promoting captioned movies. To book a screening in your area, please contact Hilari Scarl with the name of your University, organization, school or theater and available dates to get started. Q&A with Los Angeles director Hilari Scarl via Skype after the screening. Documentary Channel marks the broadcast debut. 10AM on 11/1/12 for See What I'm Saying. Dish Network (197) and DirecTV (267). Check your local listing. University of Missouri screening - free! AccessChicago special event sponsored by City of Chicago Mayor's Office. Workshops with Hilari all weekend long. Screening with director Hilari Scarl. 3PM Screening with Q&A after. Very first live interactive screening! Live intro with Hilari & TL. Live chat on the side throughout the film. Live Q&A after the screening. "Tickets" are $3.99 for digital password. March 5, 2012 Omaha, NE 7pm - free! February 22, 2012 Glendale, CA Walt Disney Imagineering - InSight Out. October 25, 2011 Ewing, NJ The College of New Jersey - free! October 8, 2011 Flagstaff, AZ 7:00PM with Q&A with Robert DeMayo. July 1 and 2, 2011 Reims, France Festival Clin D'Ceil sponsored by Cine Sourds with TL and Beethoven's Nightmare. 12 Bd General LeClerc. June 23, 2011 Amsterdam Deaf in the Picture Film Festival. Bosifest - international film festival in Serbia. May 21, 2011 Portland, OR 7PM screening with Hilari, TL and Robert. 9AM - 5:30PM - educational workshops with Robert and Hilari. 9:30PM - 11:30PM - live performance with Robert and TL. Location all at Nike World Headquarter, same as Friday below. May 20, 2011 Portland, OR 3PM Screening with Hilari, TL and Robert, 7PM VIP Party. Stanford Theater in Tiger Wood Center, Nike World Headquarter, One Bowerman Drive, Beaverton, OR 97005. Sponsored by NWASLTA. May 14, 2011 Brattleboro, VT 4:30PM screening at Latchis Theater, Main Street. Sponsored by VIRS. May 12, 2011 Tel Aviv, Israel 2PM screening followed by Q&A with director Hilari Scarl after the screening at Reframing Reality Film Festival. Shekel Organization website. April 30, 2011 Virginia Beach, VA 7PM - Tidewater Community College, Pungo Auditorium. $7 at the door. Sponsored by Blue Ridge Deaf Films Society, Inc. Voice/VP 540 324-4948. April 29, 2011 Duluth, MN 7PM - University of Minnesota, Duluth Montague Hall, 1211 Ordean Court, Duluth, MN 55812. Tickets $5. April 29, 2011 El Paso, TX 6:00PM - El Paso Community College, ASC Auditorium, 9050 Viscount. Free - no tickets needed. April 29, 2011 Winsted, CT 7PM Region 7 High School, 100 Battistoni Drive, Winsted, CT 06098. Sponsored by Northwestern Connecticut Community College Collegiate Education for Deaf & Hard of Hearing. $15 general admission, $10 current NCCC students and senior citizens. Facebook event page. April 20, 2011 Vancouver, WA 6:00PM - Washington School for the Deaf - Skyview High School Auditorium. Tickets - $10 to benefit ASL Performing Arts Series. April 18, 2011 Mankato, MN Mankato State University. 7pm screening. $5 at the door. 12:00PM, Capitol Theatre, 405 Cleveland Street, Clearwater, FL 33755. $5 tickets to benefit Family Center of Deafness and School for the Deaf. April 15, 2011 Czech Republic 10PM - Theater Hall in Konvikt, Olomouc. Website with more information. April 8 and 9, 2011 Fremont, CA California School for the Deaf - 7pm and 1pm. CSD's Little Theater, 39350 Gallaudet Drive, Fremont, CA 94538 Net proceeds will benefit the Families of Deaf Children/ITV students. April 8, 2011 Portland, Maine Maine Deaf Film Festival. 7PM screening followed by Q&A with director Hilari Scarl. Festival website. 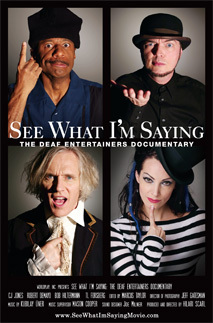 April 1, 2011 Sydney, Australia 7:00PM - Parramatta RSL, Sydney Deaf Club. Tickets are $15 at the door. March 22, 2011 Charlottesville, VA 7:00PM University of Virginia -ASL Program. 219 Bryan Hall, McLeod Auditorium. Free! March 4, 2011 Santa Clarita, CA 7:00PM screening, Q&A with Hilari, CJ, TL and Bob after the film. Voicing for Deaf Actors workshop with Hilari at 4PM. College of the Canyons Performing Arts Center. 26455 Rockwell County Rd. February 23, 2011 Northampton, MA Smith College, Weinstein Auditorium. 7:00PM screening. February 21-24 Los Angeles, CA Screenings at AMC Universal Citywalk at 3:00PM and at 8:15PM daily. SPECIAL EVENT! Red Carpet Gala and Awards at Universal Studios Hollywood and DVD release party!! 6:30pm - 10pm red carpet, event. Universal Studios Hollywood Globe Theater. Tickets here. February 20, 2011 Los Angeles, CA Screenings at AMC Universal Citywalk. AMC Website. 12:00PM and at 2:15PM. See the film and enjoy Citywalk before the Gala right next door. January 25-26, 2011 San Francisco, CA AMC Loews Metreon 16 - 1014th Street. Showtimes 11:40AM, 2:05PM, 4:30PM and 6:55PM both days. Please bring friends! January 25-26, 2011 Atlanta, GA AMC Parkway Pointe 15 - 3101 Cobb Parkway. Showtimes 11:15AM, 1:55PM, 4:25PM, 7:00pm and 9:35PM both days. PLEASE help me get folks in! January 25-26, 2011 Dallas, TX AMC Grapevine 30 - 3150 Grapevine Mills Pkwy. Grapevine, TX 76051. Showtimes are 11:15AM, 1:40PM, 4:30PM, 6:50PM and 9:10PM both days. January 25-26, 2011 Omaha, NE AMC Oak View 24 - 3555 South 140th Plaza. Showtimes 2:30PM, 5:00PM, 7:30PM and 10:05PM. Bring friends! January 25-26, 2011 Kansas City, MO AMC Parkway 14 - 8600 Ward Parkway. Showtimes 2:30pm, 5:20pm and 7:30pm both days. Dec. 11, 2010 Bellingham, WA 2:15PM Pickford Cinema. 1416 Cornwall Avenue. Dec. 11, 2010 Fremont, CA 7:00pm. Fundraiser for Deaf Hope at California School for the Deaf. Q&A with Hilari Scarl and CJ Jones after the screening. Dec. 10, 2010 Merrillville, IN 6:30PM Merrillville High School Auditorium. 276 East 68th Place, Merrillville, IN 46410. 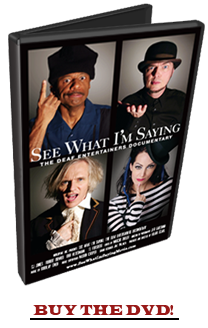 Tickets $10 to benefit Deaf Services, Inc. Q&A live with Hilari Scarl after the screening. December 9, 2010 Indianapolis, IN Landmark Art Cinema, 8702 Keystone Crossing, Indianapolis, IN 46240. Tickets $10 to benefit Deaf Community Services, a division of Easter Seals. Q&A live with Hilari Scarl after the screening. December 8, 2010 Fort Wayne, IN 6:30pm Rhinehart Recital Hall, Indiana University - Purdue University Fort Wayne, 2101 E. Coliseum Blvd. Fort Wayne, IN 46805. Tickets $10 to benefit League of Blind and Disabled. Q&A live with Hilari Scarl after the screening. December 7, 2010 Evansville, IN 6:30pm Deaconess Hospital Auditorium, 600 Mary Street, Evansville, IN 47747. Q&A with Director Hilari Scarl after the screening. November 13, 2010 Edmonton Alberta Canada 1:00PM Garneau Theatre 11404 60 Ave.
Washington, D.C. FESTIVAL WINNER! Gallaudet World Deaf Cinema Festival with Hilari Scarl. 7PM screening in #4 series. Panel discussion with Hilari on Saturday, 11/6 at 10:45AM. October 20, 2010 Durham, NC Carolina Theatre of Durham, 309 West Morgan Street. 7:30PM screening sponsored by RelayNC. October 16, 2010 Charlotte, NC Wachovia Playhouse Theater - Sponsored by Relay NC/Sprint. With director Hilari Scarl. October 15, 2010 Los Angeles, CA 7:00PM Metropolitan Community Church - Q&A with TL Forsberg, CJ Jones and Hilari Scarl after the film. 4953 Franklin Avenue. Tickets $10. October 13, 2010 Chico, CA Focus Film Festival - OPENING NIGHT FILM - CJ, TL and Hilari in attendance. October 10, 2010 New York, NY MICA Showcase - NYU Cantor Film Center, 36 East 8th Street NYC. 5:15 PM. October 8, 2010 Denton, TX Texas Woman's University. 1pm Workshops with CJ Jones and Hilari Scarl, 6pm screening with Q&A following the film. Southlake, TX Harkins Southlake 14 at 1:20pm and 6:40pm. Tickets and info. Springfield, MO Wehrenberg Campbell 16 Cine, 4005 South Ave., hosted by Alternative Opportunities, Inc.
Milwaukee, WI Deaf Awareness Festival - Q&A with Hilari Scarl. Alberta, Canada 7:30PM Mount Royal University, Wright Theatre, 4825 Mount Royal Gate SW, Calgary. Sponsored by DHHS, CAD & AVLIC 2012. Tickets $15. Horse Cave, KY DeaFestival. Kentucky Repertory Theatre. Q&A with Hilari Scarl, CJ Jones, Bob Hiltermann, TL Forsberg and Robert DeMayo. Melbourne Australia The Other Film Festival - Melbourne Museum. Honorable mention at awards ceremony. Bala Cynwyd, PA (near Philadelphia) Clearview - Bala Theatre - 157 Bala Avenue. Washington, DC Gallaudet University MSSD. 7pm and 9pm with Hilari Scarl. 9pm screening proceeds will be donated for Deaf Haitians. Washington, DC Gallaudet University MSSD. 2pm and 7pm with Hilari Scarl. Olathe, KS AMC Studio 30 - Q&A with CJ Jones opening weekend! Royal Oak, MI Oakland Community College - hosted by D-PAN (Deaf Performing Arts Network) at 7:30pm with Q&A via projected iChat with Hilari Scarl. Wehrenberg Cine 14 - 11:30 AM (Fri, Sat and Sun only) 1:45, 4:15, 6:45, 9:00PM. Q&A with Hilari Scarl opening weekend! Plainfield, NJ Union County College at 7:00pm. -- Hilari Scarl and Robert DeMayo in attendance. Syracuse, NY Palace Theater Sponsored by the Deaf Advocacy Counsel. Director Hilari Scarl and CJ Jones in attendance with full day of workshops. April 9, 2010 - Village East Cinema, New York, NY. Director, cast and crew in attendance at red carpet premiere. Received Critics' Pick in the New York Times. Director, cast and crew in attendance.